When most people think about asphalt paving repair and patching services, they think about all the work that they see being done in the hot months of summer throughout New England. However, if your driveway, parking lot, walkway, or other asphalt paving surfaces have potholes, sunken areas, or different types of damage, it is crucial to have repairs made right away, regardless of the time of year. Property owners should repair asphalt in Dartmouth and the surrounding South Coast area as soon as they discover it to prevent additional damage from occurring throughout the fall and winter months. There are just some situations where Dartmouth asphalt repair can’t wait until the weather clears up and services are needed to maintain your property and protect your investment. Ongoing maintenance is required for both residential and commercial properties to preserve asphalt paving from temperature and weather-related damage. Patching asphalt can help to extend the life of your driveway, parking lot, or walkway, increasing the return on your investment considerably. COMMERCIAL CLIENTS – For commercial property owners, it is vital to keep parking lots and driveways in good repair to prevent safety issues or damage to vehicles from clients, customers, tenants, and service providers. 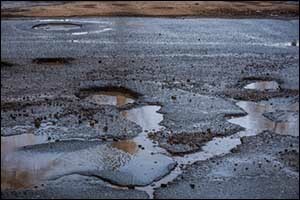 Not only does damaged asphalt paving look bad, but it can create a bad experience for consumers and establish a bad reputation for your shopping mall or service center. It is important to work with a quality Dartmouth asphalt repair company who will provide essential repair and patching services year-round. RESIDENTIAL CLIENTS – Whether you own a home or operate a multi-family residential property, staying on top of patching asphalt problem areas is also very important. You don’t want to damage your vehicle or the vehicles of guests who come to your property. For property managers, it is important to protect your tenants by ensuring that the driveways, walkways, and parking lots of safe by hiring qualified repair for asphalt in Dartmouth and the surrounding South Coast area. You might get a quote for Dartmouth asphalt repair and hear the word “temporary” mentioned, especially when the weather is cold or if there is snow and ice on the ground. The reason why these repair and patching services are considered by some to be temporary is that the freeze-thaw cycle can wreak havoc on repairs that are made in cooler weather. However, the goal of these off-season repairs is to protect motorists and pedestrians from safety issues that can occur due to cracks, potholes, sunken areas, and other problems that can occur unexpectedly. The benefits of repairs in fall and winter include reducing your liability, protecting your property from further damage, and improving the safety of visitors to your property. While patching asphalt in New England is difficult, the effort made to repair asphalt in Dartmouth to protect from accidents and injuries is a worthy investment. However, it is important to understand that you will likely be seeking out repair and patching services again in the spring or summer when everything thaws and dries out. You will want to take care of Dartmouth asphalt repair right away as soon as the weather improves to make sure that everything is repaired correctly before the cold weather returns. It pays to work with a company who can provide repair patching services year-round that has the knowledge, experience, and equipment required to get the job done right. If you own a home or business in the Greater Dartmouth area of Southeastern Massachusetts, make sure to contact ABLE Asphalt, Inc. to find out about patching asphalt or getting asphalt paving services for driveways, parking lots, roadways, walkways, and other paved surfaces. Our team is highly trained, experienced, and knowledgeable in repair and patching services, and can help you with all of your local Dartmouth asphalt repair and paving needs. We work extensively with residential and commercial clients in South Coast and can provide you with a FREE estimate for any of the services that we offer. Give us a call at 508-636-9700 and speak with one of our friendly customer service agents to set up an appointment. With over 30 years of experience serving clients in the South Coast area, we can help you with any repair or patching services you require to protect your property.